You know that Microsoft® Excel® has extraordinary capabilities-this is your opportunity learn even more about this valuable program. This one-day seminar is for the intermediate user ready to bring their Excel skills to the next level. Get ready to explore what Excel 2013 can do for you! Most users know that Excel has extraordinary capabilities, but all too often those same users get lost. Whether trying to find the feature they want or becoming intimidated by the sheer number of options and functions, the advantage of the program’s functionality disappear. Excel 2013 cuts through some of the clutter and puts your favorite, and most important features, right at your fingertips! Whether you’re working with a just a few rows, or with a million, Excel has a host of number-crunching, data dicing and info analyzing features to help you explore and tell your data’s story in rich, detailed and compelling ways. This action-packed seminar takes you beyond the basics of the program. It reveals Excel’s secrets and prepares you to face even the most daunting problems with a fresh outlook and the confidence of a newly minted power user. Build your Excel spreadsheet by using new shortcuts and quick keys that speed your abilities and transform the information into usable data. Calculations can be tricky. We can help you break through frustrating formulas and calculations with quick steps and shortcuts. Learn the importance of analysis through PivotTables and PivotCharts and the ability they bring to you. 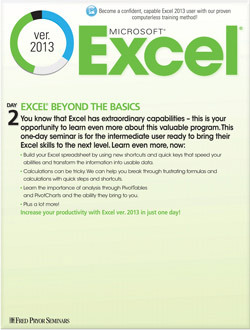 Increase your productivity with Excel 2013 in just one day! Don’t settle for out-of-the-box set up. The 2013 version allows you to personalize Excel to fit your work style and needs. Review the tested seven-step approach to get the most from Excel and begin your spreadsheet process on the right foot! It’s all about efficiency! Discover quick tips and tricks to speed up workbook creation, data entry and everything in between. Learn how tables can be your best friend - from sorting and filtering to data relationships and more. Explore the power of conditional formatting and advanced data formatting options. Master operators like AND and OR - they mean so much more in Excel than they do in the English language! Finally understand how to use IF, SUMIF and COUNTIF when calculating your data. Harness the magic of VLOOKUP. If that is a foreign term to you, you definitely need this class! Yes you can perform perfect date and time calculations every time. The more you know about formulas, the better. With advanced formula knowledge, you can get to the bottom of those formula problems quickly and easily. Use the Quick Analysis Tool to speed up formatting, charting and writing formulas. Wow your colleagues with your PivotTable genius! Learn the magic behind PivotTables and PivotCharts. Modify these powerful tools for analyzing and answering questions about your data. Take control of tables and PivotTables with calculated fields and slicers. Discover how to ensure data integrity through data validation. Learn how Track Changes and comments can promote clear collaboration. Link to and embed worksheets in other documents. Sharing is good, unless someone changes everything you worked hard to create. Prevent unwanted changes by locking worksheets down. Optimize Excel options to ensure it works for you. Learn the importance of expedient importing and exporting so that you can have data quickly and use it efficiently. Save time and reduce errors when you perform a task repeatedly, simply automate with macros. Learn the text time-savers - convert text to tables and so much more. Uncover some amazing shortcuts to take you to the next level of Excel prowess and make your fingers faster in no time!